Polycythaemia (or erythrocytosis) is defined as an increase in Hb, PCV and red cell count. PCV is a more reliable indicator of polycythaemia than Hb, which may be disproportionately low in iron deficiency. Polycythaemia can be divided into absolute erythrocytosis where there is a true increase in red cell volume or relative erythrocytosis where the red cell volume is normal but there is a decrease in the plasma volume. 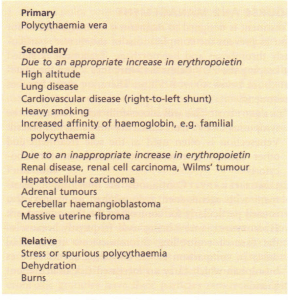 Absolute erythrocytosis may be due to primary polycythaemia (PV) or secondary polycythaemia. Secondary polycythaemia may be due to an appropriate increase in red cells in response to anoxia, or may be due to an inappropriate increase associated with tumours, such as a renal carcinoma. 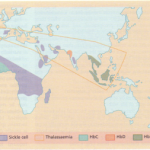 The causes of polycythaemia are given. PV is a clonal stem cell disorder in which there is an alteration in the pluripotent progenitor cell leading to excessive proliferation of erythroid, myeloid and megakaryocytic progenitor cells. The main clinical problems are due to the increased volume and viscosity of the blood and the bone marrow overactivity. The onset is insidious. It usually presents in patients over 60 years with tiredness, depression, vertigo, tinnitus andvisual disturbance. It should be noted that these symptoms are also common in the normal population over the age of 60 and consequently PV is easily missed. These features, together with hypertension, angina, intermittent claudication and a tendency to bleed are suggestive evidence for PV. Severe itching after a hot bath or when the patient is ‘arm is common. Gout due to increased cell turnover may be a feature and peptic ulceration occurs in a minority of patients. Thrombosis and haemorrhage are the major complications of PV. The patient is usually plethoric and has a deep dusky cyanosis. Injection of the conjunctivae is commonly seen. The spleen is palpable in 70% and is useful in distinguishing PV from secondary causes. The liver is enlarged in 50% of patients. HB AND PCV are increased. The WCC is raised in about 70% of cases of PV and the platelet count is elevated in about 50%. THE BONE MARROW shows erythroid hyperplasia and increased numbers of megakaryocytes. RED CELL VOLUME measured using slCr-labelled red cells is increased (>36 ml kg-l in males and 32 ml kg-l in females). Measurement of plasma volume shows normal or increased values (normal range is 45 ± 5 ml kg-I). SERUM URIC ACID levels may be raised. 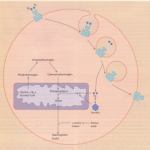 LEUCOCYTE ALKALINE PHOSPHATASE (LAP) score is usually high. SERUM VITAMIN Bl2 and vitamin Bl2-binding protein (TC I) levels may be high, although these are not routinely measured. in PV the level is low or normal; in secondary polycythaernia the level may be raised, as expected, but may be normal. VENESECTION. This will successfully relieve many of the symptoms of PV. 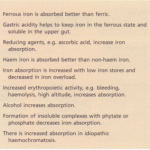 Iron deficiency limits erythropoiesis. Venesection is often used as the sole treatment and other therapy is reserved to control the thrombocytosis. CHEMOTHERAPY. Continuous or intermittent treatment with agents such as busulphan or hydroxyurea is used particularly for controlling the thrombocytosis. 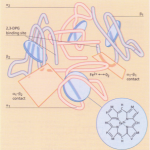 Hydroxyurea is now being used frequently because of the ease of controlling thrombocytosis and general safety in comparison to the alkylating agents such as busulphan which carry an increased risk of acute leukaemia. RADIOACTIVE 32p. One dose may give control for up to 18 months but the administration of 32p carries an increased risk of transformation to acute leukaemia. Is usually confined to the over 70 years age group. 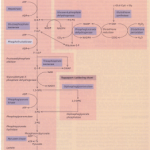 Allopurinol is given to block uric acid production. The pruritus is lessened by avoiding very hot baths. HI-receptor antagonists have largely proved unsuccessful in relievingdistressing pruritus but H2-receptor antagonists such as cimetidine are occasionally effective. It should be noted that patients with uncontrolled PV have a high operative risk; 75% of patients have severe haemorrhage following surgery and 30% of these patients die. Polycythaemia should be controlled before surgery. In an emergency, reduction of the haematocrit by venesection and appropriate fluid replacement must be carried out. PV develops into myelofibrosis in 30% of cases and into acute myeloblastic leukaemia in 5% as part of the natural history of the disease. The causes of these are shown. The treatment is that of the precipitating factor; for example, renal or posterior fossa tumours need to be resected. Heavy smoking can produce as much as 10% carboxyhaemoglobin and this can produce polycythaemia because of a reduction in the oxygen-carrying capacity of the blood. Complications are similar to those seen in PV, including thrombosis, haemorrhage and cardiac failure, but the complications due to myeloproliferative disease such as progression to myelofibrosis or acute leukaemia do not develop. Venesection may be symptomatically helpful in the hypoxic patient, particularly if the PCV is above 0.55 litre litre:”. This condition was originally thought to be stressinduced. The red cell volume is normal but, as the result of a decreased plasma volume, there is a relative polycythaemia. ‘Stress’ polycythaemia is commoner than PV and occurs in middle-aged men, particularly in smokers who are obese and hypertensive. The condition may present with cardiovascular problems such as myocardial or cerebral ischaemia. For this reason, it may be justifiable to venesect the patient. Smoking should be stopped. Essential thrombocythaemia (ET) ET is a rare condition that is closely related to PV. The patient has >1000 x 1Q9/litre platelets. It presents with bruising, bleeding and cerebrovascular symptoms. Initially splenic hypertrophy may be seen but, as the condition progresses, recurrent thromboses due to the increased number of platelets reduce the size of the spleen and it may atrophy. ET has to be distinguished from secondary thrombocytosis that is seen in haemorrhage, connective tissue disorders, malignancy, after splenectomy and in other myeloproliferative disorders. Treatment is with hydroxyurea or busulphan to control the platelet count at less than 400 x 1Q9/litre. Alpha-interferon is also effective but it is expensive and is administered by subcutaneous injection. ET may eventually transform into PV, myelofibrosis or acute leukaemia but the disease may not progress for many years.